Finca Cortesin Hotel, Golf & Spa has received global acclaim from the International Association of Golf Tour Operators (IAGTO) after being unveiled as the winner of the 2018 IAGTO Sustainability Award for Resource Efficiency. The exclusive resort in Andalucia, Spain, claimed the coveted award for the first time in its burgeoning history after being singled out for special praise by the judging panel for its commitment to water conservation. Each year, IAGTO – in partnership with the GEO Foundation – celebrates the outstanding sustainability achievements of golf facilities, resorts, and destinations around the world. Currently in their fifth year, the awards acknowledge the high performance and commitment across three core areas of sustainability – Nature, Resources and Community. The 2018 IAGTO Sustainability Awards were announced, along with the IAGTO Awards honouring excellence in golf tourism, at the International Golf Travel Market in Cannes, France. 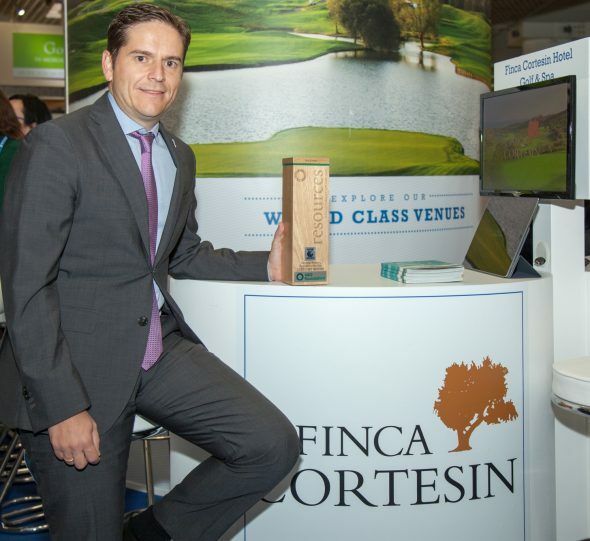 Miguel Girbés, director of golf at Finca Cortesin Hotel, Golf & Spa, said: “It’s a tremendous honour for the resort to be given this award and to receive global recognition for our work in conserving the environment. “Finca Cortesin’s privileged location allows our guests to enjoy the magnificent natural beauty of the surrounding countryside, and we realise how important it is that this is both preserved and enhanced. Finca Cortesin has undertaken a comprehensive upgrade of its 18-hole championship course in 2017, including becoming the first course in Spain to feature a new, environmentally-friendly type of Bermuda grass on all its putting surfaces. Committing to head greenkeeper Ignacio Soto’s proposal to install a greens system that is more eco-friendly, cost effective and sustainable, the resort began a three-year implementation process, with Soto testing a variety of different grasses on the practice putting green and short-game area. Having also carried out a major bunker drainage improvement programme this summer to reconstruct its bunkers using the renowned ‘Better Billy Bunker’ system, the resort was recognised in particular for its concerted approach to water conservation. Annually certified to ISO 14001 environmental standards, Finca Cortesin uses 100 per cent recycled waste-water from a local town and has managed to reduce its consumption by 40 per cent. Changing the grass species on the greens to a warm-weather, Ultra Dwarf Bermuda grass – the grass was grown separately at a nursery in the centre of Spain allowing the process to be completed in barely a month – auditing the irrigation structure and installing state-of-the-art Toro Lynx irrigation management has also reduced the amount of pesticides used. And Finca Cortesin’s progressive environmental strategy extends to the trees, shrubs and fauna that have been allowed to thrive in and around the resort. Understanding the importance of working with nature, the club has devised and is implementing a sustainable programme that allows self-sufficient indigenous plant species to survive and flourish in their natural surroundings, reducing the amount of water and upkeep required, while maintaining the level of presentation expected at one of Europe’s most exclusive golf venues. Set across a vast 532-acre estate, Finca Cortesin’s 18-hole championship course was designed by Cabell Robinson and has hosted numerous high-profile tournaments since opening in 2006, including the Volvo World Match Play Championship in 2009, 2011 amd 2012. It is also a member of the exclusive European Tour Properties network. Located in the rolling hills of southern Spain between Marbella and Sotogrande, with the Mediterranean to one side and the tranquil Casares Mountains to the other, Finca Cortesin’s other world-class facilities include an elegant 67-suite hotel, Hotel Cortesin, a state-of the art Jack Nicklaus Golf Academy, a 6,000sqm Beach Club and an award-winning spa featuring Spain’s only snow cave, with bespoke treatments by French beauty brand Boilogique Recherche. Hotel Cortesin offers the choice of four restaurants including El Jardin de Lutz, serving authentic Spanish cuisine, and the Michelin-starred signature Japanese restaurant Kabuki Raw. The development also features an exclusive collection of villas which are available for purchase or rental.